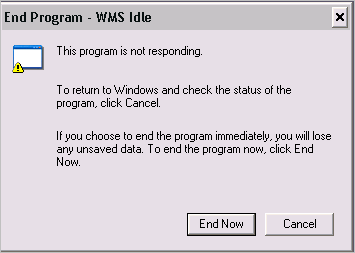 After you applied a Microsoft Office update for Office 2003, you get the End Program – WMS Idle windows when you try to logoff or shutdown your Windows XP computer. Go to the start menu, click on “Run”, then type MSCONFIG in the box. When the MSCONFIG editor opens, click on the “Start up” tab and locate the NMBgMonitor command, uncheck the box and click Apply. You will need to restart Windows.